The Harz  is a low mountain range in the Central Uplands of Germany, famous for its historic silver mines that brought prosperity to the region and to the Kingdom of Hanover. The Harz forms part of the federal states of Lower Saxony, Saxony-Anhalt and Thuringia. It lies between the river Elbe and Weser in the states of Lower Saxony, Saxony-Anhalt and, to a small extent, Thuringia. The range runs for sixty miles from northwest to southeast and is 20 miles wide. The terraced plateaus are made of limestone, sandstone and slate and have been cut by many narrow, deep valleys. The two highest peaks in the area are the legendary and mysterious Brocken (1,141 metres or 3,743 feet high) - just higher than Snowdon - and the Wurmberg (971 metres or 3,186 feet high), both of which are made of granite. The higher, northwestern area is known as the Upper Harz (Oberharz) and the lower, southeastern area is the Lower Harz (Unterharz). The highest mountains - around the Brocken - are sometimes called the High Harz (Hochharz). The Upper Harz plateau slopes from 3,300 feet high in the west down to 1,600 feet in the centre and suffers from a cold and damp climate, even in the summer, caused by its susceptibility to westerly winds. The Brocken rises above thi plateau and is internationally famous for the stories and myths associated with it in local folklore and literature. The summit of the Brocken is bare and has an Alpine climate, but its lower slopes are forested and interspersed with moorland and river beds. The Lower Harz has a gentler climate which has enabled it to be exploited by agriculture. The area supports grain and cattle farming, and was once abundant with game, lynx, bear and wolf. They were hunted to extinction, but there are projects to reintroduce some of these native animals again. The area is also famous for a number of rarer animal species, including the Harzer Roller canaries, bred for the mines. Between the 10th and 16th centuries, the area became immensely important for mining and metallurgy; lead, silver, iron, zinc and copper being the main products. Easy access to water and wood helped the early settlers, however dams have been introduced to control the waters to remove the possibility of flooding or shortages in the summer. These dams now generate hydroelectric power as well as drinking water for the area. On an industrial scale quarrying (marble, granite and gypsum) as well as wood processing for paper and cardboard provides sources of income. The area is also heavily dependent on tourism with water sports and resorts being important, but it is its forest scenery in the Harz National Park which attracts the majority of the tourists. The Upper Harz (Oberharz) in the west, in the state of Lower Saxony. The Lower Harz (Unterharz) in the east, in Saxony-Anhalt. In addition the area around the Brocken with the highest peaks in the range is also referred to as the High Harz (Hochharz). Prior to 1990, the border between Lower Saxony and Saxony-Anhalt was also the border between East and West Germany complete with fence and fortified frontier. The Brocken was an East German and Soviet military surveillance post used to spy on military activity in Western Europe. From the East German side access to many villages was severely restricted. Roads and railway tracks were either closed or demolished, thus later facilitating the establishment of the Harz National Park. The division of the Harz by the Iron Curtain is still noticeable in the marketing of the Harz as a tourist destination with various sites on the old Inner German Border being preserved for historic and tourism reasons. Tourism is the main source of income for the region. Unemployment is high, especially after the collapse of the industrial complexes in former East Germany. The number of tourists visiting a town is politically important. Goslar and sourounding villages compete against the cluster of Wernigerode, Quedlinburg and Blankenburg and the Southern Harz regions in attracting tourists. This competition is not always friendly! Recommendations on where to go in the region may be coloured by a person's (East German or West German) origin. Each of the regions tries to pass itself of as the "ultimate Harz experience". Try to the forget about the East/West rivalry as reunification is more and more a thing of the past (and a long term success) in people's minds at least, and just enjoy the wild and natural beauty of the area. The access point for the Northern part is Goslar, which can be reached from Hannover and Halle(Saale), while the southern part is reached by train from Göttingen and Erfurt. From Berlin, BerlinLinienBus  runs daily to the Harz from Berlin ZOB. The A 38 runs south of the Harz from Halle to Göttingen and the A 395 connects Goslar and Bad Harzburg in the northwest with Brunswick (Braunschweig). The A7 connects Göttingen in the southwest and Hanover in the North as well as Brunswick. From Hanover follow the A7 down to the "Seesen/Harz (67)" junction to follow the range from north to south , or to the junction "Rhüden Harz (66)" to follow to the north B82/B6 to Goslar, Bad Harzburg and on to Wernigerode. The B 6 is an important east-west dual carriageway along the northern edge of the Harz. The best-known mode of transport is the historic narrow-gauge steam railway network operated by the Harz Narrow Gauge Railways (Harzer Schmalspurbahnen) or HSB. There are also other, standard gauge lines run by Deutsche Bahn, mainly around the margins of the Harz. Local buses connect towns which are not on the railway line. Having your own car is recommended if you want to travel extensively in the region. Inside the national park the only permissible ways of getting about are on the steam railway, on foot or by bike. The Brocken  is the highest mountain in the Harz range and the highest mountain in Northern Germany. • 1886 the Gernrode Harzgeroder railway AG (GHE) was formed. • 1896 the Nordhausen-Wernigeroder-Railway (NWE) followed. • 1897 followed the Southern-Harz Railway from Walkenried to Braunlage. Since 1899 it has been possible for passengers to travel up to the summit. Altogether there operated a narrow guage railway net over 130 km long, The Southern-Harz Railway did not survive and the GHE and NWE were eventually taken over by the authorities of the German Democratic Republic (GDR)from 1949 to up to the fall of the Inner German Border. The main route to the Brocken starts at Wernigerode with several minor stops on the way. The two main connection stops are Drei Annen Hohne and Schierke. Be aware though, the trip up and down will take about 1¾ hours. The night train journey is most beautiful in the winter months especially when snow is on the ground. Schierke - Brocken - Schierke, approximately 15km with a 600m height difference, the return route takes approximately 5 hours not including stopovers. Torfhaus - Brocken - Torfhaus (Goethe Trail), approximately 17km with a 550m height difference, route takes approximately 6 hours not including stopovers. The TV Tower. The tradition of radio and TV engineering on the Brocken dates back to the beginning of TV broadcast. It was determined in 1929 during the first wireless television broadcasting, that the short wave used was not suitable for television. Also, very high locations were required for its transmitters to transmit the very high frequency required for TV to succeed. In 1934, the post office was given responsibility for the building of a mobile transmitter. 1935 saw the first public picture transmission. 1936 saw the live transmissions of the Olympic summer games in Berlin. From 1936 to 1937 a 52 metre high television station and hotel with 16 floors was built. With the installation of the antenna system in 1938 the television station became operational. With the beginning of the WW2, television transmissions stopped, however radio broadcast on up to 40 transmitters was carried on. Only the explanation breaking into to the fortress, let feel the mountain of the Germans also the war. In April 1945 an air raid by the Americans destroyed the hotel. The transmitter however was spared to be used by the occupying forces. In 1947 the allied troops pulled out toward the west. To justify the Americans having their part of Berlin, Saxony-Anhalt was handed to the Soviets. The Americans left in a state of chaos and left the station a gutted ruin. In 1948 the TV tower was shortened by around seven floors and a flat roof was added. 1973 to 1976 saw the new landmark 152 metre high metal end transmitter masts built to enable the transmission of the East German TV channel “DDR 2”. Now there is a museum  and restaurant, a more modern hotel and various cafes. Thew views from the summit are breathtaking and with the correct equipment and right weather conditions, some towns and reference points can be seen up to 80km away. The Witches. The Brocken is surrounded by myths and stories of witches and broomsticks. Also known as the Blocksberg, it is the surrounding for a very well known German children character called Bibi Blocksberg, a child witch in modern times. The summit, surrounded in mist and cloud most of the time, gives rise to the many stories of witches, devils and trolls and of them flying around the summit at night. This is also why the symbol of the Harz is a witch flying on a broomstick. The well known German writer, Goethe, was fascinated by the Brocken and wrote a famous play called Faust based on it. Incidentally, this can be seen in the form of a rock concert in the Goethersaal (Goethe Hall) on the summit. This is a combination of a night trip on the train and concert. The roots of the present Walpurgis Night celebrations are well documented in pre-Christian times. But it is a far cry from the Christian festival that was Walpurgis Night is always celebrated on the eve of the feast of Saint Walburga, a learned woman and abbess of a convent, whose life has no connection with witches and the devils celebrated today. Only her canonization by Pope Adrian II on a first May is the connection to today's Walpurgis Night, this due to numerous miracles which were attributed to her. She is however also the patron saint of the seafaring and against evil spirits. According to Harz legend, the witches gather on Walpurgis Night on the Hexentanzplatz (Witches Ballroom) in Thale, in order to fly together from there to the Brocken on brooms and pitchforks with their cats, where the witches feast takes place. Supposedly they dance in a large circle with their backs to each other, around a fire and then kiss the devil's behind. The witch's apprentices can then marry the devil, whereupon the witch was given a physical mark and given full powers of witchcraft. As stated previously, this is now a well known modern festival and people can be seen on the night dressed as witches, devils and such like and a very big party atmosphere is enjoyed. Rübeland is part of the Upper Harz Brocken community, a village of nearly 1000 inhabitants. The village is situated near the Bode river, and in the Harz mountains is best known as being an important railway station on the Rübeland Railway, originally built from 1880-1886 and previously known as the Harz Railway. The Rübeland Railway operates special festive train services at different times of the year between Blankenburg  and Rübeland using old steam locomotives. The journeys take about 45 min each way, and there is the attraction during Advent of visiting the Christmas market in Rübeland. Amongst the other attractions nearby is the famous viewing point on the Schornsteinberg ("Chimney Hill") which is also a checkpoint on the Harzer Wandernadel hiking network. The Oker Valley (Okertal) can be found approximately 6km southeast of Goslar. A romantic valley with magnificent rocky scenery and the Romkerhall Falls, it is considered by nature and trekking enthusiasts as the most beautiful valley in the Harz Mountains. The River Oker runs through the this stunning valley, starting in the middle of the Harz National Park, at over 900m high and runs in a general northerly direction, for 105 km until it joins with the River Aller at Müden/Örtze near Celle. Historically, the River Oker has formed an important political boundary. It flows through deep rocky ravines and over waterfalls. This is the Oker Valley at its best. Since 1956 the Oker Valley Dam (Okertalsperre) has stopped the river from overflowing. This was an issue in the late 40's when the towns of Brunswick (Braunschweig) and Wolfenbüttel were flooded. The dam stopped this happening again. However the small hamlet of Schulenburg was destined to flood, by the dams construction. So the site was evacuated in 1954 and rebuilt above the dam. The dam provides drinking water for towns as far away as Hildesheim and Hanover, as well as being a very efficient hydro-electric site, that provides over 4 megawatts of power to the surrounding area. The Oker Valley branches out and can accumulate up to 47 million cubic metres of water in the Oker Lake (Okerterrasse). Below the dam, the river flows leisurely to the Raven Crags (Rabenklippen), so called from an old legend: a pious man was ordered by St Boniface to return the Northern Harz to Christianity. But he was ridiculed and retreated into the Harz, where he got lost. At the site of today's Raven Crags he nearly dead from hunger, until a flock of ravens saved him. They supposedly dropped a dead pigeon close to him on which he fed thus saving his life. A visit here to the lynx enclosure (Luchsgehegen), part of the lynx re-integration project, is a must. This area has been made accessible to the public with steps and railings. From here, one has a wonderful view of the Harz. The River Oker and Valley continues towards Goslar, coming next to Römkerhall, the smallest kingdom of the world ever proclaimed. This settlement consists of only a few houses and the hotel "Kingdom of Romkerhall", which resembles a fairy tale castle. The area was, in the second half of the 19th Century, the hunting grounds of King George V of Hanover. Also here, is the Romkerhall Waterfall, approximately 64 metres in height. Upstream from the waterfall the River Oker is used occasionally by canoeist. Downstream where the water flows faster, the crags left and right of the Oker are popular with climbers. Also downstream of the waterfall is "Betrothal Island" (Verlobungsinsel), which is accessible via a small bridge. The River Oker finally arrives in the village of Oker on the outskirts of Goslar, leaving behind the beauty of the deep ravines and rocky outcrops. Instead you will find that the river has been seriously polluted from many years of metal smelting in the area. Selke Valley is dominated by the river Selke with its source in the Lower Harz and a tributary of the river Bode falling over an overall height of 340 metres. The river is 64 kilometres in length of which 30 km flow through the mountains of the Harz and the last 34 km through the agricultural land of the Harz approaches. The river itself was often the cause of sudden floods with water bursting its banks, and as a result a number of dams were planned along its route. The most recent project is a storm water embankment near Meisdorf planned to be 12 to 18 metres high. A local protest movement has claimed that the embankment would ruin the landscape, and futher arguments have been raised by inhabitants in villages up stream that not enough flood protection is available and so plans are in progress for dams at Straßbeg to protect the current storm water dam at Uhlenbach. Selke Valley Railway. Amongst the attractions of the Selke Valley is the Selke Valley Railway or Selketalbahn. This is a metre gauge railway that passes through Quedlinburg, Gernrode, Alexisbad and Harzgerode, with branch lines from Alexisbad to Stiege to Hasselfelde, and from Stiege to the Eisfelde Talmühle, much of this track being relaid in 2006 to link to the Harz Narrow Gauge Railway. The railway itself has become a delicatessen for railway aficionados as it travels through the most dramatic parts of the central Harz using small steam engines of which only 17 were built, and the route traverses the steepest grade in the Harz railway system of 4%. At Stieg station there is a unique terminal loop known as a balloon loop which allows heavier trains destined for Silberhütte to turn without reversing. 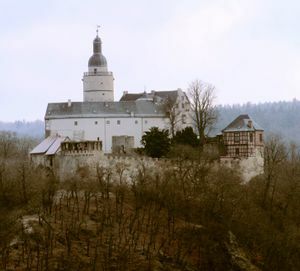 Falkenstein Castle, a striking medieval castle, high on a ridge above the Selke Valley, was built between 1120 and 1180 and since then has been used in a number of different ways. Because of its position it was never successfully captured. Today the castle is a museum and one of the most popular places to visit in the Harz Mountains. The museum is on the so called 'Romantic Road' and contains amongst other things a falconry, and a restaurant that offers a special 'Knights' Menu'. Since 2006 a European-wide singing competition has been held in the castle known as the 'Minneturnier', which refers to a singing contest in the Middle Ages, and today famous singers from Austria, Italy, France, Switzerland and Germany take part. The castle is number 200 on the Harzer Wandernadel hiking network. Bode Gorge is a part of the Bode Valley (Bodetal) between Tresburg and Thale. The gorge originates on the eastern side of the Brocken and runs from a depth of 280 metres at Thale up to 140 metres at Tresburg. The gorge is a nature reserve in its own right covering an area of just under 500 hectares and is only accessible by foot. Other forms of transport are banned, including rafting, and walking off route is forbidden, but an accessible path leads the entire 10 kilometres (6 miles) of its length. There are a large number of interesting places, along the route, many linked to old German myths and traditions and there are 4 stations that count towards the Harzer Wandernadel. 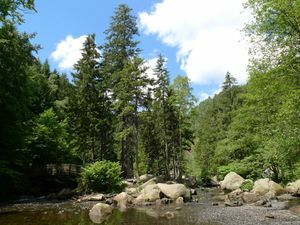 The Bode Gorge is one of the most popular walking destinations in the Harz Mountains. The Harz hosts a mountain bike marathon each year which includes some particularly demanding stretches. This page was last edited on 10 April 2015, at 00:45.